Many people rely on caffeine, a substance that's absorbed quickly, for energy. However, some people are sensitive to caffeine or don't want to include it in their diet. They're seeking caffeine alternatives. Other nutrients, foods and drinks can also raise your energy levels, so you do have alternatives if you don't want to rely on a large cup of coffee, tea or soda for alertness. Complex carbohydrates like those in bananas and oatmeal provide immediate energy. The body can also store these important nutrients for later use. Carbohydrate loading can help you perform better and recover faster. Interestingly, carbohydrate intake and caffeine use have comparable performance-enhancing effects. Both of them, for example, can significantly increase speed in long-distance cycling races, according to a 2015 article in the Open Access Journal of Sports Medicine. Read more: What Is the Meaning of Carbohydrates? B vitamins help your body metabolize the foods you eat, which means they're essential for energy production. A B vitamin deficiency can cause fatigue and poor concentration, according to a February 2016 review in Nutrients. Vitamins B-6 and B-12 play a role in the production and maintenance of the myelin sheath around cells. The myelin sheath increases signal transmission in the brain, something that can help with energy. Vitamin B-12 also helps with red blood cell production, and red blood cells help transport oxygen throughout the body, which also helps boost energy levels. Foods rich in B vitamins include lean meats, nuts, seeds, eggs and fortified grains. Adding these to your daily routine can help boost your energy and replace your usual dose of caffeine. Including protein in your diet can help boost your mood, improve your concentration skills and increase your energy levels. Replacing your afternoon cup of coffee with a serving of protein can give you the same energy-boosting results. Have a handful of nuts or seeds or some white-meat chicken rolled up in a whole-wheat tortilla. The same goes for breakfast. If you want to remove caffeine from your morning routine, prepare a protein-rich breakfast to help you get up and go. Eggs, lean meat, low-fat dairy foods, nut butter on whole-wheat toast and smoked salmon on a bagel all supply good doses of protein. Dehydration can cause lack of energy and fatigue, so drinking more water can offer an alternative to fueling up on caffeinated beverages. 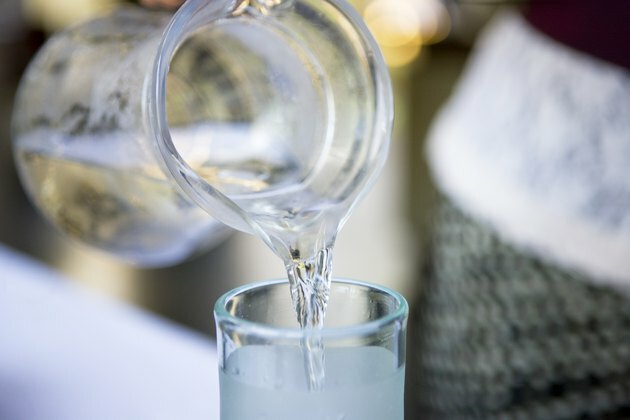 The American Diabetes Association suggests that women consume 91 ounces of water each day from foods and drinks and that men consume 125 ounces. Doing so can keep you well hydrated, which can result in an increase in your energy level. If you're experiencing that midday slump, reach for a glass of water instead of a caffeinated cup of coffee or a soda. Certain herbal remedies can give you a caffeine replacement, though you should always speak with your doctor before adding these to your daily routine. Manufacturers often add ginseng to energy-promoting beverages, according to a March 2018 report in the Journal of Preventive Medicine and Hygiene. Schisandra berry extract and ashwagandha are other herbs used to boost energy. Guarana and the other active ingredients found in energy drinks might also boost mental alertness and increase metabolism, according to a January 2016 article in the Journal of the Royal Society of Medicine.